The time has come for our first a little bit bigger and more demanding game as part of our birthday celebration giveaways. Maestra already showed you her manicure in B-day manicure post. Now it’s your turn. Be creative and send us photo of your manicure or make up look to join in the celebration. All photos will be published on 01.02.2010. At the same time poll will be added. Our readers will then decide who are the lucky winners. Pool will be closed on 05.02.2010. Two photos with majority of the votes will be getting first (most votes) and second prize. This game is sponsored by NATI Studio. Zoya polishes: Yasmeen, Tart and Veruschka as well as glass nail file. Zoya polish Roxy and glass nail file. Subscribe to our blog in WordPress or with Google Friend Connect. You can read HERE about reasons for subscription. Send us your photo of birthday themed manicure or make up look (it can be photo of whole face or just the part of it) by 23:59, 31.01.2010 GMT+1. Photo size must be 300 x 400 or 400 x 300 pixels. If you don’t know how to resize to exact number, HERE are the instructions. Photos must have evident authorship, so your signature (your user name) should look something like THIS. Send your photo to our email address blog parokeets.com. Photos may not contain any URL addressees, only your nickname is allowed. We can hardly wait to see what will you come up with. Next articleHow do we store our polishes? Wowww how cool! I can’t wait to see the creations! 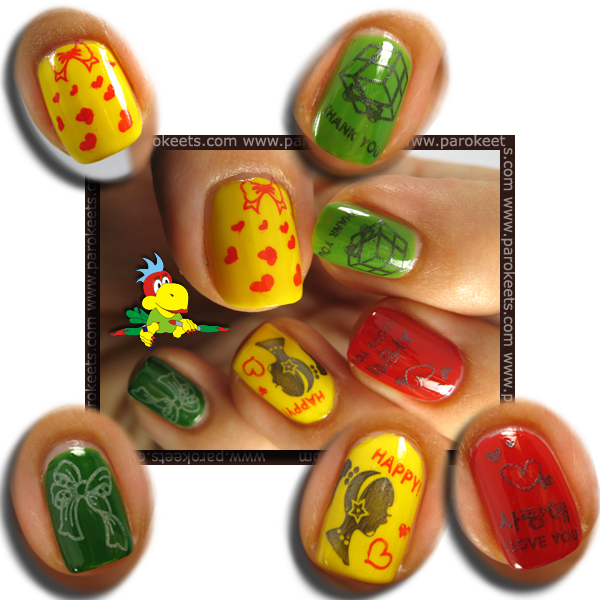 congratz… im so excited to do a bday nail art theme for u…God Bless..
Mhm tudi jaz bom se kar lepo prikljucila :P….